Last year, Jose Faber Cabrera donated Php2,130.00 to Kapit Bisig Para sa Ilog Pasig by selling loom bands (bracelets) which he personally designed and sold to his friends and relatives. He vowed to do more similar projects and continue his advocacy of rehabilitating the Pasig River. (L-R) Raniero Ramos (Senior Donor Relations Specialist-KBPIP), Melvic Cabasag (Admin Officer-KBPIP), Jose Faber Cabrera (KBPIP's Young Ambassador), Arlene Yumol (Admin Assistant-KBPIP), and Maita Cabrera( Jose Faber's Mother) during the turn-over. True to his word, he once again generated and donated Php7,200.00 by selling shoe bags made from katcha (flour sack) which he diligently crafted and sold to his classmates and friends. 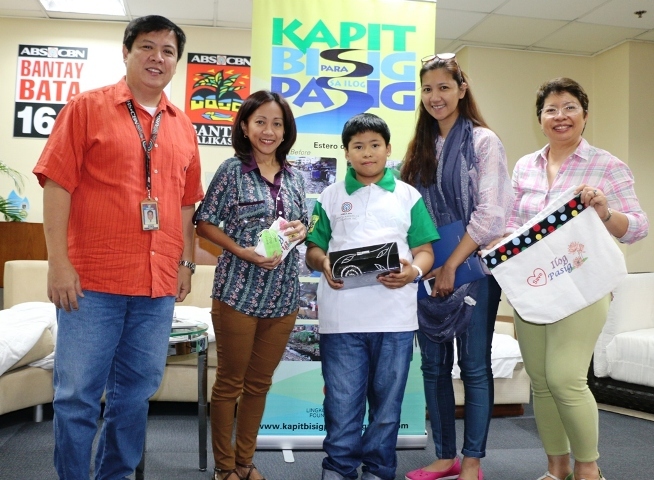 He enthused that the katcha were provided to him by his grandfather who happens to reside in Pandacan, one of the areas covered by KBPIP. A musician by heart who plays the drums and organ, he plans to do a mini-concert with a band or a musical group this year to continuously help raising funds for Ilog Pasig. These small acts of kindness are really not small at all, because even the smallest acts can ripple around the world and inspire and influence all human beings. Rightfully, this 9 year old embodies what every human has to do and contribute to save the environment and create a better world.